Draught Marks (a.k.a. Filtration Soiling) on carpets - "London's finest cleaning"
It is also known as filtration soiling, fogging or dust marks. The cause is always the same. Contaminated air blows through or across the carpet and the carpet acts as a filter, removing the dirt from the air. The resultant draught marking is both unsightly and a problem to remove. Using flexible mastic to seal the gap between the skirting board and the floor. 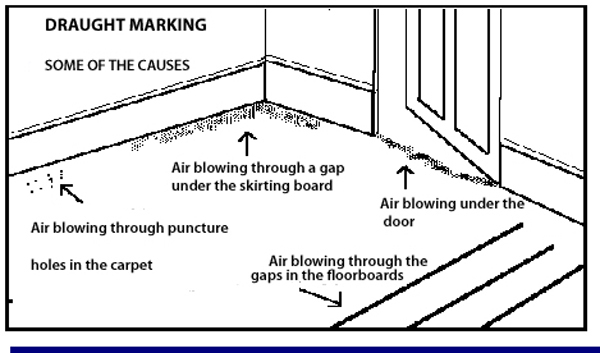 If these measures are carried out before the carpet and underlay are installed then it is unlikely that very much draught marking will occur . Most draught marking can be removed by cleaning, but not cured. The microscopic airborne soiling is tenaciously oil bonded to the carpet fibres. The degree of success in the removal of the soil depends on the nature of the soil (pollution) and the length of time that it has been present. At Designcare we have researched and tested many ways of removing draught marking and we are now confident that we can remove the majority of this soiling. However a draught marking problem can’t be cured by cleaning as the soiling will return if the contaminated air is allowed to continue to flow through or across the carpet.